It is not possible to reduce the balance if the numbers are reduced less than 7 days prior to arrival. No shows and cancellations less than 7 days prior to arrival will result incur a charge of the full stay. We require payment of the full balance 1 week prior to arrival. Set in the middle of the souqs, 5 minutes from Place D'Jeema el Fna, Riad Jennah Rouge is like a flower with a million rainbow coloured petals that will both soothe and complement the senses . We would say 'after a day of sightseeing in Marrakech', but actually, the riad will be part of your 'sightseeing experience'. 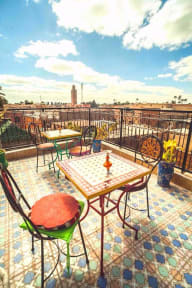 If you are a backpacker at heart, but no longer fancy sharing bathrooms; if you want to share travel stories over tea, but don't want to compromise on luxury - indulge yourself a little at Riad Jennah Rouge. 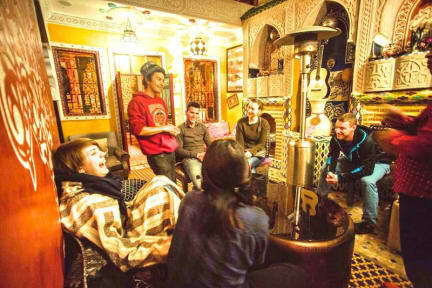 It too is a backpacker hostel at heart, as are the people who renovated it, but it also a little bit of luxury - from the three magical fountains in the courtyard to the shisha annexe, to the secret garden on the terrace. With stunning ensuite rooms and several communal areas, you can choose privacy and sharing; chat with other travellers or find yourself a nook to read in. We welcome you to our Riad Jennah Rouge. Cancellation policy: 48 hours before arrival. In case of a late cancellation or No Show, you will be charged the first night of your stay. Any amendments to reservations UPON arrival also require 48 hours notice. Check in from 13:00 to 23:00. Perdro, Said and Zakia were all kind, friendly and very nice! I were at Jennah Rouge with a friend, and they shown us everything! How to make a tajin, where to find better things to buy, where to eat, where to go and places to visit! We spent a lot of time with them and was everything so great! I’m happy of my experience in Marrakech, and I definitely recommend Jennah Rouge for all tourist! See you soon!! One of the highlights to my trip to Marrakesh. The facility the location and the value for money were amazing, but the most surprising part was the staff : the two guys that are managing the hostel are incredibly friendly and available. I had a great time here and I wish to come back as soon as possible. Thanks for everything guys! the best hostel in the world! Great position, nice staff and rooms are very clean. We had a good time, hope to come back soon! Vicinissimo alla piazza principale, ma difficile da trovare anche dopo esserci già stati! Molto carino e pulito per essere un ostello, personale cordiale che ci ha viziato con una buonissima colazione inclusa in terrazza e the marocchino al nostro rientro a tarda notte (e non solo.... 🌿). Avevamo due camerate con bagno in camera, ma una delle due docce purtroppo aveva l'acqua fredda, ma è stata l'unica pecca. Posizione facilmente raggiungibile, a differenza di tanti altri riad persi nel dedalo della Medina, e comoda alla piazza. Personale gentile e discreto. Per gli standard europei la pulizia non è il punto di forza del riad, consiglio di portare comunque lenzuola e federa da casa o sacchi letto. Stanze fornite di clima (non è indicato nel sito) il che è una gran cosa considerando che siamo stati a Marrakech in pieno agosto. Colazione buona e ambiente affascinante.